This walk: 2012-9-13. 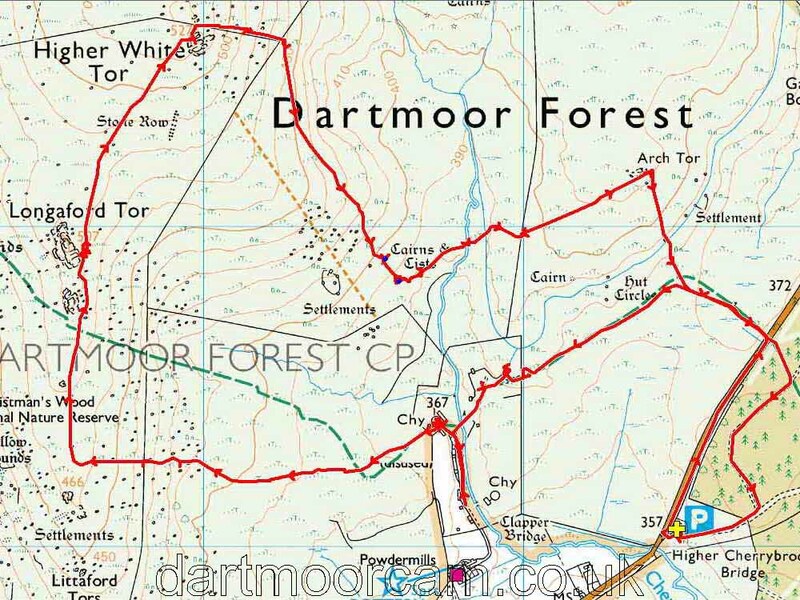 Powdermills, Longaford Tor, Lich Way, ruined buildings, chimneys, waterwheel pit, Beardown Tors, Littaford Tors, Bellever Forest, Higher White Tor, Fernworthy Forest, Hereford cow, cists, Arch Tor, Bellever Tor. Longaford Tor, SX 61565 77931, elevation 507 metres (1663 feet), seen from the car park. Higher Cherrybrook Bridge, from the car park. Notice of a Lich Way diversion - actually 718 metres, the 250 metres on the notice must be converted from a Devon country mile! The first ruined building encountered that was part of the old Powdermills complex. These buildings generally had two parts with a waterwheel between them. The walls were massively thick to withstand explosions but the roof was flimsy and designed to blow off if there were an explosion. A bank can be seen at the extreme right, leading the leat to the waterwheel. The gunpowder was generally known as rock powder and was used by the tinners for mining, quarrymen for blasting and farmers for clearing rocks in newtakes. Powdermills is described by Helen Harris (1968) in Industrial Archaeology of Dartmoor, David & Charles, Newton Abbot, page 128-133. There are three waterwheel houses or "incorporation mills", each accompanied by a smaller nearby building to store the gunpowder, "magazines". The other buildings performed various other functions to do with the handling and packaging of the powder. The Legendary Dartmoor web page gives a list of references. View of the building with is two rooms and central water wheel area. Vaguely artistic photo of the ruins. Looking into the wheel pit. Looking from inside one room, across the water wheel pit and through the second room to the outside. Looking through a window, showing the massively thick walls (approx. 6 feet thick). Looking right through the building, from outside. The chimney seen at the start of the walk. Showing one of the path guidance posts (not too many of these! ), the second chimney on the site and other remains of buildings. Second chimney with Longaford Tor behind. The first chimney seen again after walking along the track towards the modern buildings. Base of the second chimney base. Base of the second chimney. Looking back at Powdermills after leaving the site. One of which has a Firing Range flagstaff. Looking back at Littaford Tors. Looking up Longaford Tor from our lunchtime stop. Rock formation very close to Longaford Tor. Sweeping view back over Bellever Forest. Looking at Longaford Tor from the top of Higher White Tor. Looking at the gaps in a dry stone wall. Looking down on an area of flowering Western Gorse (Ulex gallii). The second cist, at SX 62610 77829, as described above. Looking back up at Higher White Tor. Your's truly on Arch Tor. A movie the Arch Tor logan stone. Crossing a leat at SX 6344 7795, that appears to run to Powdermills from Archerton. A modern road in the forest. This walk was reached by parking at the Higher Cherrybrook car park on the B3212 between Two Bridges and Postbridge, at the P symbol on the map with the yellow cross. A more sensible parking spot another time is where the red track on the map above crosses the road - this is because the old Lich Way was been diverted in 1999, due to marshy conditions around the old section of the path.